The grand winners of the recent fall 2018 session of THE SPARK of Le Flambeau program were announced at a recognition ceremony held in Cap-Haitien Haiti at Institute Dr. Luc L. Colas on Saturday November 17, 2018. Three winner certificates were presented with the grand winner also receiving a TOEFL test study kit along with a fully paid voucher to take the TOEFL test when ready. You will note that the grand winner did something never seen before – an impressive testament to the team culture of the program. 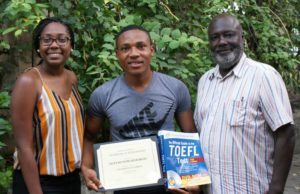 This is the eighth year for the program and the first time the program hosted a smaller class of seven focused solely on students from the Cap-Haitien area. We thank our English Grader Ms. Bijou Gervais who donated her time for this session, evaluating and providing constructive feedback to this class each week. Ms. Bijou received consistently high evaluation marks from the students (skewed Excellent). Overall, THE SPARK of Le Flambeau fall 2018 session was scored at 4.6 (out of 5 points) by the students. Outstanding! Congratulations to all! Most Improved Award was earned for making the most impressive strides forward. Most substantive information in each of the weekly comments. Everyone learned something new from her comments. This is the top spot. Earned for having offered the most well rounded presentation. Based on observation of progress, substance, teamwork and perseverance. Exhibited leadership and made the strongest impression. 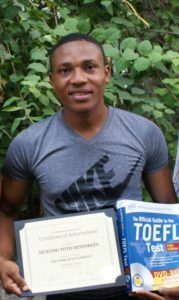 Winner Vicktho, in addition to receiving his certificate, received a full TOEFL test study kit and a fully paid voucher to take the TOEFL test when ready, within a year. At the ceremony winner Vicktho made a remarkable decision. In addition to assisting participants as needed throughout the session, he selflessly decided to share his TOEFL guide with others and to pass forward his TOEFL test voucher to Hermeline, in the true spirit of Le Flambeau Foundation. This is the spark that makes all the difference. About THE SPARK of Le Flambeau. THE SPARK of Le Flambeau is an on-line language exchange program focused on extending educational opportunities to bright under-served youth in Haiti, now in its eighth year. 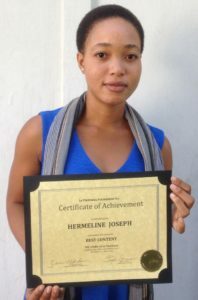 The program is complimented by in-country activities and aims to improve fluency in English language reading and writing in preparation for the TOEFL test and to improve access to more immediate employment options in Haiti, for youth in Haiti. An introductory micro session was held with a new group of students in Cap-Haitien, Haiti. The session ran for four weeks. Two of the Le Flambeau Foundation scholars who received full college scholarships to the U.S. along with others who received new educational and job opportunities, are alumni members of THE SPARK of Le Flambeau. To read about the weekly winners from this class (click here). To read about an earlier class (click here).